Hello all you beautiful Muses! This time next week I'll be in New York City with hundreds of other bloggers attending the Lucky Fabb fashion and beauty blogger conference. I'm so excited to be doing this, as last year I went to my first IFB_Con and that was pretty great. My hope is that this year won't be as crazy hectic as last year. I had over-planned (and under-planned at the same time); it rained...it just wasn't cute. But this year will be fabulous. That is my mantra and I'll be repeating it and willing it into reality. And how can it not be fabulous with a lineup like this? Rachel Zoe...Lauren Conrad...Simon Doonan...Anna Sui...I have no words. ♥ Look gorgeous and carry a big bag. You'll need a place to store the freebies! 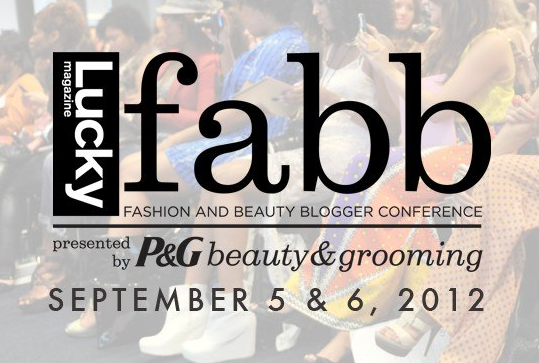 Will you be at Lucky Fabb this year? Have you attended any blogger conferences yet? Sounds like you are are all ready! Loving everything you have packed ... Cannot wait to see you there. Hi Cheryl, this sounds like a great, fun and interesting event, so lucky to be attending, can't wait to hear all about it. Really good advice too. loved the heels and envelope clutch. The program for that conference sounds really exciting - I can't wait to hear all about your conference experiences. BTW, I know you've probably gotten this a million times, but I nominated you for a blog award. This sounds like it will be an amazing experience. Can't wait to hear all about it so I hope there's a follow up post on your trip! + Some of those sessions sound really interesting. Would love to attend, thanks for al the info. wow, this sounds very interesting, funny, i havent attended any blogger conference lol, maybe soon :p.
love your picks especially the collar necklace,i am a huge fan of statement or bold necklaces.love the mustard pants wow smashing!!! i hope you bring back the good memories at the conference and share with us, can't wait!!! I WISH I could attend Lucky FABB. Priorities took over, and I have to save for my wedding instead. Hopefully next year! I'm rethinking what I said about NYFW this year, but the shows I got invited to are the following week, so I don't see how I can make it to the Lucky conference. :( Will you be around, though, the 8th through 10th? Would love to get together! oh wow that sounds fun! Rachel Zoe and LC!! Oh btw honey in response to ur question my firm favourites or should I say HG foundies are Nars Sheer Glow which gives a glowy radiant look and Lancome Teint idole ultra 24hr which gives a flawless matte look. I have normal/combo skin w oily tzone and both these foundations look natural lightweight and don't clog pores. Seems there are loads of fun things happening between IFBCon, and LuckyFabb that I've been hearing. it would be great to attend Lucky Fabb one day. Have a great time! Love your look and advice! Just the fact that Rachel Zoe and the Man Repeller will be there makes this look like an amazing event! Have a fantastic time and enjoy the Big Apple! Wow, you lucky lucky thing!! The conference does indeed sound fabulous, and in NYC too?! Totally envious of you right now, have a FABULOUS time! You are so lucky to attend this! I'd love to be back home and go, especially to hear from all those speakers! I am so excited you'll be at FABB! 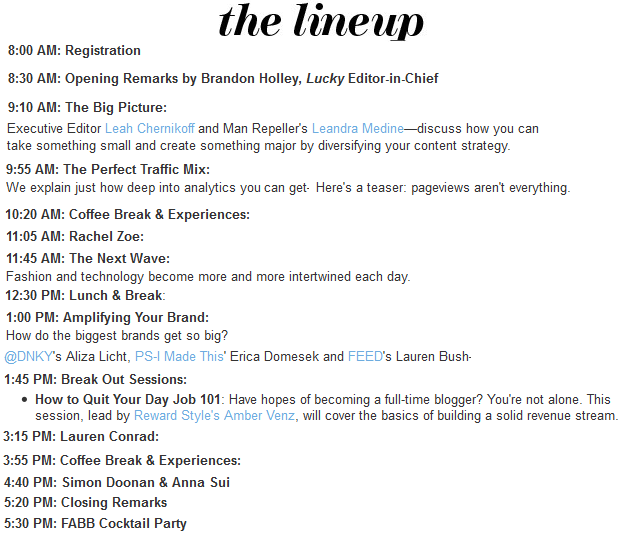 The line-up of speakers is amazing and OMG Rachel Zoe will be there!!! "lucky" hehe You!!! It will be so fun and informative. This is an amazing event to be a part of, can't wait to hear all about it! Aw, man I'm going to IFB this year, I would have loved to meet you. But thank you for sharing, I was freaking out about what to wear and bring. Hi dear, thanks for your comment...have a great Friday! Huh Rachel Zoe. I die. Hope you have a great time with the bloggers, I'm so jealous! Great board for inspiration/packing and great tips. Definitely a charger and camera and large gorgeous bag. Personally, I'd find a fashion blogger conference intimidating to attend b/c I'm not well dressed enough ;). I'm sure you'll rock some awesomeness and receive some awesome compliments! Oh you'll be in NY!!! I'm not going to any of the conferences this year, but would love to meet up. I saw you for only a hot short second at ifb, which was not the best place to meet, so would love to sit down and chat.